Does that sound strange? It could be even more! Henry Ford got legions of folks to move from the South by offering Five Dollars a day for auto workers. That was a ten hour day, troops, so Ford was paying a half dollar an hour. Since today's minimum wage is $8.75 an hour, you might argue that the multiplier would be in the range of 14. Unfortunately Ford's "Five Dollars" was a mixture of base compensation ($1/day) and "Incentives" up to $4.00. The incentives were keyed to the production of the entire assembly line, so workers (in effect) policed themselves. A study by Forbes magazine indicated that the $5 figure was rarely made and that compensation was more like $2.50/day. Women and Negroes were excluded from the incentive system. So, the multiplier ought to be something like 28 if we consider Ford's wage as a barometer. In fact, Auto workers now make on the order of $20 an hour for 8 hours. Incentives or not, Ford's wages were good wages. My dad had a job unloading freight cars that paid about fifty cents a day --- and guys would stand in lines for hours to get that kind of work. And --- it got worse during the depression when about 35% of the population was unemployed. For the average guy, times were tough and things like dancing and movies were expensive luxuries. Throughout the depression, however, folks went out in droves. To get an idea of how much they sacrificed, we decided to take a look at price changes and put 1927 into 1998 dollars. There are three major factors that have gotten us to where we are: Taxation, Revaluation of Gold, and "Inflation". Take a few seconds and look at some math and economics. Taxation: You buy things with money that is left over after you pay your taxes. In 1927, income tax was about 1% on incomes over $10,000. There was no FICA, city, or state income taxes and there was no sales tax; there were special purpose taxes and fees for lots of things. Today, the federal Income tax rate is about 32%, FICA eats up about 7.5%, City and State taxes take 9% and sales taxes are about 5-8%. Allowing for deductions and other niceties, the average family in 1927 got to keep about 92 cents for every dollar of income. In 1998, the same family gets to keep about 46% of what it earns. Thus, a dollar of income in 1927 has double the purchasing power of a dollar of income in 1998 because you got to keep just about twice as much. Revaluation of Gold: In 1933, by executive order, President Roosevelt raised the price of gold from about $16 per ounce to about $25.00. Thus in 1933, every ounce of gold in Fort Knox could support 1.56 (=25/16) times the number of dollars that it could in 1927. Guess what? Uncle Sam, being on the Gold Standard, printed these extra dollars and put them into circulation. This was good news for everyone except those who held gold-backed bonds, since they made their investment in dollars expecting to get a certain number of ounces of gold in the future; with one stroke of the pen, they got 64% of what they thought they were going to get. But, as the saying went at the time, that was a small number of Plutocrats who probably caused the depression anyway. Whatever they were or did, they were no fools; by 1933 you needed $1.56 to buy what $1.00 had purchased in 1927. Inflation: The Department of Labor hired a lot of statisticians during the 1930s and began to study the phenomenon of "inflation". That is, every year, they would compare prices for the same "market basket" of goods; year-to-year changes in price under this method are called "inflation". This is also known as the "Cost of Living Index" which forms the basis for those "Cost of Living Adjustments (COLAs)" that you see in the papers today. The COLA from 1933 to 1998 is 10.37, according to the Labor Department. Inflation from 1998 to 2013 would bring the factor to about 35. How does this work? Applying the factor, the $15.85 high quality suit with two pairs of pants comes out to $512.82, not far away from current prices that we have seen. You can get suits a lot cheaper than that now, and, according to our 1927 Sears Catalogue, you could find a cheaper suit for $3.50, or about $113 now. The Raccoon Coat at $39.50 would cost $1,278 today, which is probably what you would pay if you could get a furrier to dodge the animal rights activists and actually make one. The console radio would set you back $2,349.65 today, making it comparable with a big-screen projection TV --- which is sort of what it was back in 1927. My own house was appraised at $10,000 in 1927 according to the DC property tax records. Today it is appraised at $330,000; however, the 1927 appraisal would convert to $323,500, so my house has gained about $5,500 in real value over the past 71 years. You could get a Model T Ford for $650 in "any color as long as its black" --- this works out to about $21,000 which is the cost of a basic Ford today. As a sidebar, we might ask: "Who has benefitted from 1927 to 1998?" Organized labor has been one of the big winners. Ford's workers made ten cents an hour which would be worth about $3.24 per hour today; since wages in the auto industry are much higher -- say in the $10/hr range, it looks like union guys did pretty well. Who lost ground? Federal employees have lost some purchasing power. In 1927, there was actually a "GS-1" position which paid $1,000 per year. In fact, back then, all the "GS" levels corresponded to the annual salary. Thus,GS-14 meant $14,000 per year. Here is an advertisement from the 1932 issue of Popular Mechanics that indicates that a job paying $158/mo ($0.82/hr or $1,896/yr) in 1932 was a coveted position -- and you had to be away from home most of the time! If you worked really hard, your annual salary could eventually get to $2700! In 1927, a GS-1 would have received a 1998 equivalent salary of $32,350, considerably higher than the current minimum Federal salary. Our Rail postal clerk would start as a GS-2 and would have received a salary equivalent to about $62,000, quite aqbit higher than starting salaries at the US Postal Service. 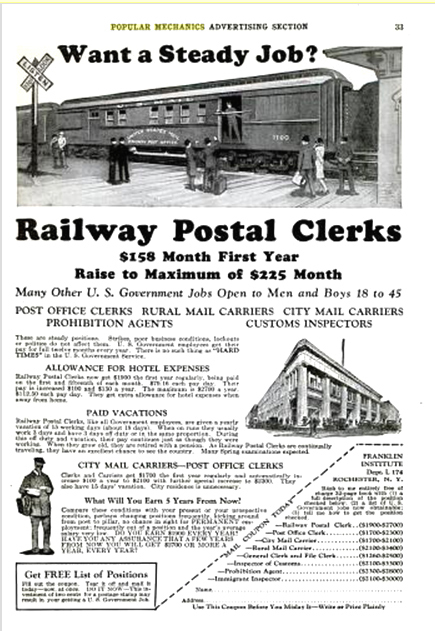 (Rail postal service was eliminated in 1963) Similarly, a GS-15 in 1927 would have purchasing power equivalent to $485,000 in 1998, as compared with current maximum salaries in the range of $150,000. Thus, it looks like federal workers have lost some ground, particularly at the high end. It looks like the definition of the "Super Rich" has been scaled down; in 1927, these were people who made over $10,000 per year because they got socked with the progressive income tax. That $10,000 equates with $325,600 today; how would you like it if you didn't have to pay any tax until your income hit that level? OK, we're just duffers, not professional economists, so we expect a lot of mail on this subject. We expect to hear about beta weights and lagged time series and all kinds of stuff. The point is, you don't seem to go very far wrong if you multiply stuff by about 30 to get from 1927 to 1998. In this example, we've converted the 1927 prices to 1998 dollars and put them in bold face. Remember that $1 in 1927 is $32.35 in 1998. 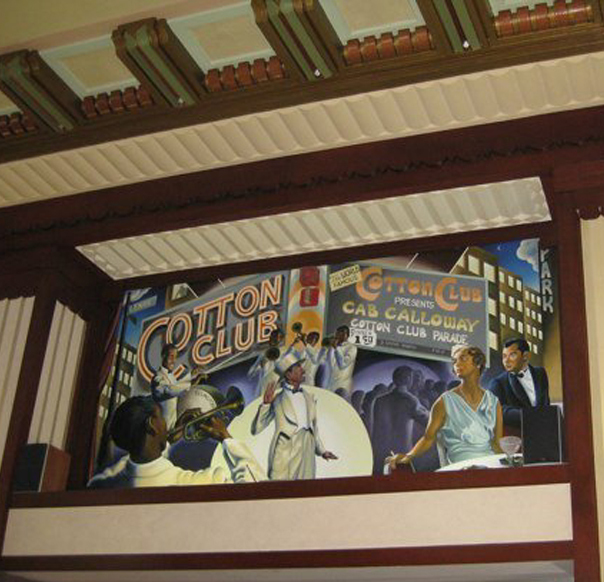 Let's go to page 74:"Money flowed freely at the Cotton Club.... to pay for the forty entertainers in the lavish shows cost $4,000 ($129,417) per week...the Club charged exhorbitant prices beginning with a $2.50 (80.89) cover charge. Hard liquor was not sold, although mixers were available. At $1 (32.35), a bottle of Maddens #1 Beer (named after gangster Owney Madden who ran the club) was quite reasonable. The prices of mixers encouraged the customers to drink beer, or discouraged them from drinking any liquor they may have brought with them. A glass of orange juice cost $1.25 ($40.44), a quart of lemonade $3.50 ($113.24), a tiny bottle of ginger ale cost $1 ($32.35). Even Milk was 50 cents ($18.18). A steak sandwich was $1.25 (40.44) as was a plate of scrambled eggs and sausage. Lobster and crabmeat cocktail could be ordered for $1 ($32.35). A side order of olives was 50 cents ($16.18). The Chinese soups were all 50 cents ($16.18) and the most expensive main dish, Moo Goo Gai Pan was $2.25 (72.80)." Indeed, an Evening at the Cotton Club was not cheap. We also find that the average salary for the entertainers was $100 ($3,235) per week. No wonder it was such a big deal to work at the Cotton Club. However, we find that in 1927, Ethel Waters seems to have been a great bargain, making $1 ($32.35) per night. Sonny Greer, Ellington's drummer, made $45.00 ($1,456) per week from which he amassed the most amazing drum kit in the Universe, including matched and personalized Typmani, Gongs, Chimes, temple blocks and a vibraphone. 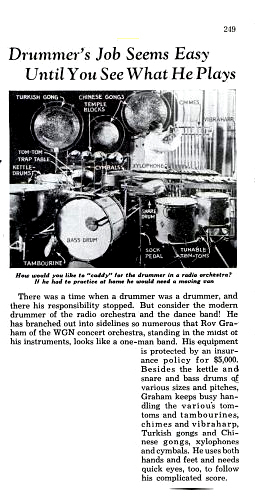 Identification of Instruments in a 1930s "Full Drum Kit"
However, base pay seems to have been only the start. Tips were off the wall. First of all, a quart of "imported" but illegal champagne could be ordered for $18 ($582.38); it was not uncommon for huge tips to be awarded for waiters who opened these bottles by sending the corks popping to the ceiling. Sonny Greer (page 58) recounted this anecdote: "Anytime we needed a quick buck, we would push the piano up to the table of the biggest racketeer in the joint. I would then sing My Buddy to him. I never remember getting less than a $20 ($647.09) for such an easy five minutes work. I keep hearing how bad the gangsters were. All I can say is that I wish I was still working for them." Duke Ellington also said,"It didn't really matter what the salary was. A big bookmaker like Meyer Boston would come in late and the first thing he'd do was change $20 ($647.09) into half dollars and throw the whole thing at the feet of whoever was singing or playing or dancing. If you've ever heard $20 in halves land on a wooden floor, you know what a wonderful sound it makes." So, if you take a look at the golden days of Lindy Hop through todays glasses, things were pretty expensive. It looks like Prohibition generated all the money for these gangsters to toss around at the Cotton Club. The cost of those dollar beers ($32.35) was practically nil! In fact, when you look at today's dollar equivalents of illegal champagne and beer, things start to look like street drug prices. Did people really pay what seems to be astounding sums of money for entertainment in Harlem? The answer seems to be a resounding "yes" and the source of the money was illegal activity. Perhaps 71 years for now, someone will be asking the question about whether some people in the 1990s really paid $150 for sneakers or $200,000 for gold-plated Ferraris. (As we revisited this in 2013, these prices begin to seem like bargains!!! Think about this when you get asked to pay a cover charge of $10 or $15 today. The roots of Lindy and Swing are not in poverty. We have had some correspondence on this article from folks who think that we should omit the Gold and Tax factors and stick only with the Consumer Price index, which is a multiplier of about 10 instead of 32. We would disagree with them. We made a trip to the Montgomery Mall to check out some real world prices in 1998. First, we checked out the High Priced Suit, which was advertised by Best and Co., Fifth Avenue and 35th St in a full page ad in our 1927 New York Times, commemorating Lindbergh's flight. We figured that Nordstrom's would be a good analogue, so we checked in with the menswear department. They do not sell any suits with two pairs of pants; however, we found that prices ranged from $500 to $800 for men's suits. Remember that the 1927 price of $15.85 converts under our method to $512.82, so we think that we are in the ballpark here. Next, we stopped in at Rosendorf-Evans, the furriers. They did not have any raccoon coats in stock, but an older staff person did know what we were talking about. It was her estimate that you would have to pay in excess of $2,000 to have such a coat made today. Remember that raccoon coats were offered in 1927 for $39.50, which converts up to $1300 or so using our methodology. Our multiplier of 32 seems to get us closer to the mark than the CPI figure of 10, again. When these items were in fashion, they could have been mass-produced and sold for somewhat less than a one-off item, so we continue to feel confident about our methodology. Haskins tells us that in 1927, 40 people worked for $4,000 per week; from that we infer that the average salary was about $100 per week, although some made considerably less. For example, Sonny Greer made $45 per week then and Ethel Waters made $7 per week. Using the CPI figures, we think that it is implausible that Sonny would have worked for $450 per week in 1998 dollars; if he did, he certainly would not have had the wherewithal to amass the enormous drum kit! We asked Capone Music of Annandale to try to come up with an estimate of the cost of Greer's drum kit in 1998. Fortunately, the fellow that we spoke to knew his Ellington very well, and he made an estimate of somewhere around $14,000. The vibraphone is a big item of expense. We feel that our estimate of $1,456 is a better characterization of Sonny's weekly 1998 purchasing power. It also explains why the tips from gangsters were so welcome. Those tips also argue for the higher multiplier. Here we have the absolute pinnacle of the swing world, in Duke Ellington's own words, enthralled when forty half dollars come crashing down on the stage, courtesy of the Philistine, Meyer Boston. We think that about $640 is a much better explanation of this behavior than $200. Note that in all these examples, our estimate is slightly low and the estimates using the CPI figures are way low. There is one commodity which has not changed since 1927 -- and that is Gold. In 1998, gold was valued at $295 per ounce. In 2013, the same ounce was $,1250. In 1927, the value of gold was pegged at $16 per ounce by law. In the 71 years, gold has increased in value by a factor of 18.4 (=295/16). This is lower than our figure, but almost double the CPI figure. Once again, we stress that the income tax situation was different then --- you have to earn twice as much money now to have the same amount of dollars to spend as you did in 1927, because government takes about half your income now (and didn't then). So, we would argue that the change in value of gold ought to be multiplied by two to put every thing on a comparable footing. This gives us something like 36.8 which is a lot closer to our figure of 32.4 and not at all close to the CPI (alone) figure of about 10. So, we stand by our analysis. I enjoyed the article you published. A few notes on economics. You are right that the CPI is a poor means of measuring inflation. This is due to an immense amount of factors, but the most obvious one being that under a capitalist system (with the assumption that the value of the dollar stays fixed), prices tend to go down because of improved production methods and competition. Thus while the CPI may be fine and good for comparing todays "prices" to yesterday's, one can't actually use it to compare the actual "value" of products. The best measure of the value of the dollar is the use of Gold; it's a commodity whose value fluxuates very little. Your usage of the low income tax to rationalize the difference between factors of 18 and 32 is probably somewhat valid. Also, the value of wages has gone up (this is due more to the government than unions per se; had the government not mandated collective bargaining and minimum wage, unions would probably have gained a bit less ground increasing wages)--so manufacturing values should be more expensive now. But as the value of gold illustrates, taxes and wages have a different influence on different products. The purchasing power of the dollar relative to the value of gold (which is more or less constant) has only dropped by a factor of 18 whereas the value of the dollar relative to that of a car has decreased 30 fold. Thus one can obviously conclude that the factor you mention varies for different products, so a universal factor of 30 is probably incorrect. It could be higher on average, or more likely, it's somewhere between 18 and 30. I'm not sure. This is certainly an issue for a professional economist. If you're interested, I've found the resources available at http://www.capitalism.net to be of value. I also wanted to commend you on the unsympathetic look you take towards the policies of the New Deal era (and its consequences afterwards). It's rare to find people who objectively look at the facts; they often conclude--as they should--that we're worse off as a result.